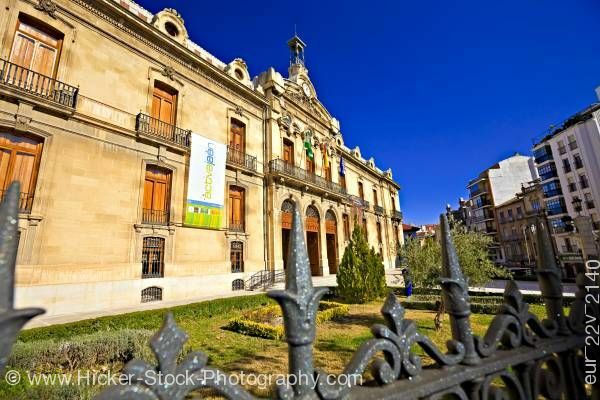 Stock photo of the Palacio de la Diputacion (Provincial Council Offices), Sagrario District, City of Jaen, Province of Jaen, Andalusia (Andalucia), Spain, Europe. The architectural details of the Palacio de la Diputacion in the Sagrario District. Seen just over the curving details of the wrought iron fence is a view of the Palacio de la Diputacion and the manicured lawn. The front of the stone building has the three beautiful arch ways as the entrance and the decorative keystones above the wood doors. Small walkways with railings sit in front of the many wood doors on the second and third floor of the building. The entrance has a clock in the decorative cornice along the roof line. A white and green banner hangs from the second floor of the office building. Palacio de la Diputacion (Provincial Council Offices), Sagrario District, City of Jaen, Province of Jaen, Andalusia (Andalucia), Spain, Europe.